We are aiming to raise £3000 to help do research, maintenance and conservation at the Umphafa Private Nature Reserve in South Africa. Situated in KwaZulu Natal, South Africa, its a 6,000 hectare reserve comprised of a number of farms previously managed for cattle and encompasses a wide range of habitats from acacia savannah and bushveld to mountainous terrain. Due to previous agricultural practices many of the natural inhabiting species had been lost. This is a private reserve for conservation and research purposes and no tourists are allowed on the site. Colchester Zoo works together with the locals to maintain the habitat. We are two students at University of Essex, Francis a second year maths student, Wenjing, a master psychology student. We both have an interest in conservation and if you want to know more then just ask us! We want to do more to help the environment which is why we are doing this doing this project, we hope we can contribute our little bit to leave a lasting impact that will help future generations in ensuring the long term sustainability of the nature world. 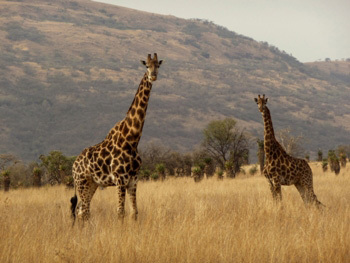 The staff is doing everything required to protect rare animals such as giraffes, zebras or rhinoceros. We are both aware of the importance of maintaining and preserving natural habitats and know what disastrous impact humans can have on nature. As students, we have the unique opportunity to help the locals doing this necessary work at the reserve. Furthermore, the reserve is working with locals, especially with children, to help them understand the right steps to keep their unique ecosystem flourishing. The donations will go towards the programme fees and getting us there. Programme fees are £700 pp, flights £700 and kit £100. Total: £3000 for 2 people or £1500 each. Any additional money raised will go towards purchasing some extra equipment needed such as boots, sleeping bag, thermos, hoodies, etc. To thank people for donating we have rewards such as thank you messages on social media, postcards from South Africa or even video or pictures if you donate generously. Please check the rewards section for more details. Find us here for updates and ask any questions you may have! Help us help them! By donating for this project, you become an active part of life preservation. If you can’t donate then share this project to as many people as you can to raise awareness and to show that anyone can be the change in the world. Help us preserve what we have had the chance to know but need to cherish.